If you love her sweater, it's available at Topshop for $80 and you can click on the image in the set below for more information. 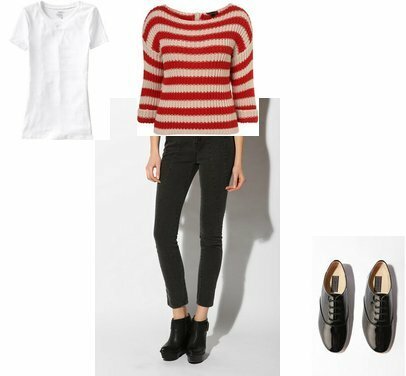 I took the liberty of putting together an entire outfit based on Sienna's, and if you're really on a tight budget, there is a very affordable striped red and white top HERE that would work as another option (although it does have many differences). Actually, Urban has something similar right now and it's on sale for only $14.99. Just saw it this morning :) The strip is slightly different, but it is the same colors and has a lot of texture.